Centro di Permanenza Temporanea (literally Center for Temporary Permanence) sounds like a rather poetic oxymoron, being a place were illegal immigrants (“illegal aliens” according to the US immigration law) are kept waiting to be rejected to their country of origin. A very difficult undertaken indeed, this “repatriation”, given the increasing dimension of the migration phenomena towards the southern coasts of Italy. Therefore most of these “illegals” stay there as long as they succedd to escape and go back in the society’s grey zone of sans papier. More pragmatically Google’s translation for Centro di permanenza temporanea is “detention center” and as a matter of fact their name has been changed by the italian law in Centro di Identificazione ed Espulsione (CIE) reflecting the recent evolution in migration policy matters. 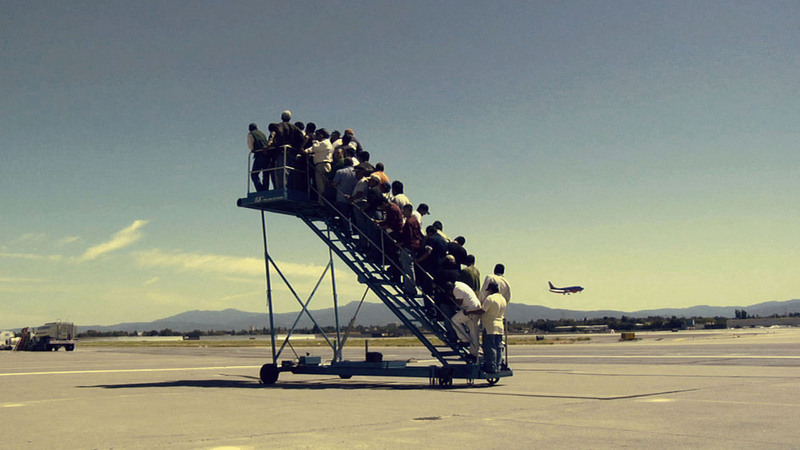 This picture is a frame of Adrian Paci’s famous video Centro di Permanenza Temporanea (2007) and shows a bunch of people waiting on a ladder in an airport runway, looking at a fighter-bomber passing by. To learn more about Adrian Paci watch this extract from a beautiful documentary by Alessandra Galletta, broadcasted by Babel TV, the first Sky Channel dedicated to life of migrants in Italy. ha ha this picture is so funny.thank you for sharing.